Mike Turzai, Speaker of the PA House, has some ambitious legislative plans. Got any salt? Might want to get a few grains ready. I'm about to tell you what GOP State House Speaker Mike Turzai tells me he wants lawmakers to do before the November elections. 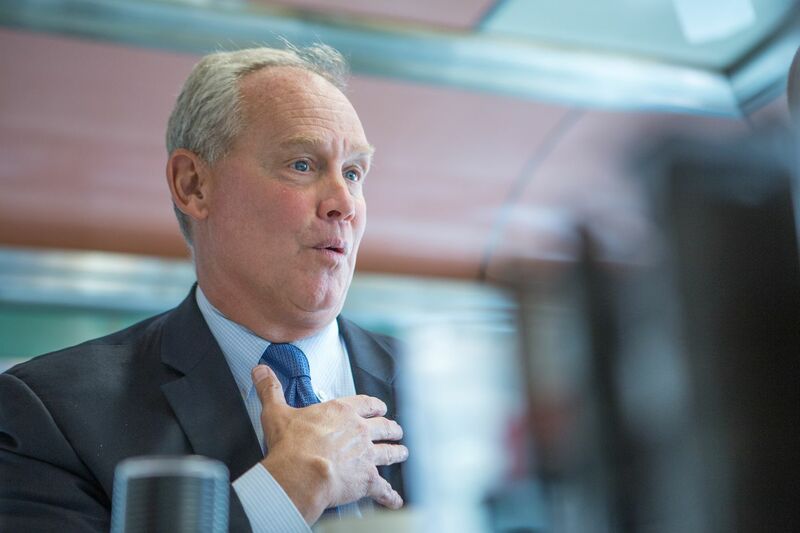 In a far-ranging conversation — rare in that he wasn't yelling at me — Turzai outlined priorities, including redistricting reform and reducing the size of the legislature. These issues are long stalled or ping-ponged between House and Senate with little or no expectation of passage. And Turzai's push comes with just nine scheduled session days the rest of the year, beginning Sept. 24, when lawmakers return from a three-month summer break. When I mention this small window, the speaker says he wants to add some days. As if, I think, lawmakers seeking reelection want more time in Harrisburg, less for campaigning at home. But OK. Let's hear him out. He proposes changing the method of drawing maps for our 18 congressional districts, and doing it by statute. You'll recall that the state Supreme Court this year ordered new districts after ruling old GOP-loving gerrymandered districts unconstitutional. Those new districts, in place for the upcoming election, will all but certainly help more Democrats get to Congress. So, the high court's action and its likely result made lots of Republicans unhappy. In Turzai's case, livid. Then, an effort to get a constitutional amendment creating a citizens' commission to draw maps got scuttled by the legislature. Now Turzai wants to bypass the constitutional route and create a commission based on the model used to draw legislative lines. Hang with me. Few things in politics are more important. Legislative lines, per our constitution, are done by a five-member commission: House and Senate minority and majority leaders, "or deputies appointed by each," and a fifth person chosen by the four leaders. The fifth person can't hold public office. If the four leaders can't agree on a fifth, he or she is appointed by the state Supreme Court. The same could be done for congressional maps, says Turzai, because our constitution has no provision for congressional maps. Currently, they're drawn through legislation requiring the governor's signature. Turzai's bill is being written. It likely will stipulate no member of the legislative commission can also serve on the congressional commission. It isn't a horrible idea. No matter the legislature's makeup, no matter who the governor is (since he or she wouldn't be involved), both parties have equal standing — subject to a court appointee, if necessary. Even David Thornburgh, head of Philly's good-government Committee of Seventy and a big supporter of a citizens' commission, says, "It beats nothing. It's a productive conversation to have." And size of the legislature? Yep. Turzai wants a vote on cutting the House from 203 to 151 members, legislation once described by an editor of mine as the state's greatest document since William Penn's charter. It makes sense. Largest full-time legislature. Costs taxpayers $337 million a year. Does next to nothing worthwhile. They've futzed over size forever. But now there's actually a bill cutting the House. It passed both chambers last session and passed the Senate in June. If it passes the House now, it can go on a ballot and voters can make it happen. Oh, and Turzai is not the only GOP leader pushing last-minute reform. Senate President Joe Scarnati just introduced legislation (SB 1234) to open party primaries to independent voters. It's another good idea. As it has been for years. There's already a stack of hot issues — more protection for victims of domestic violence, broader rights for survivors of child abuse and increased criminal penalties for hazing among them — awaiting action. A skeptic (and when it comes to motives and action of our legislative leaders, skepticism is justified) might see this round of reform flag-waving as more about preelection optics than genuine interest in a greater good. I want to believe major reforms can happen in Harrisburg. I want to believe positive change is possible. But what I believe right now is it's time to pass the salt.